The Summer Palace, an Imperial Garden in Beijing, is a masterpiece of Chinese landscape garden design that is noted for its harmony and large scale. 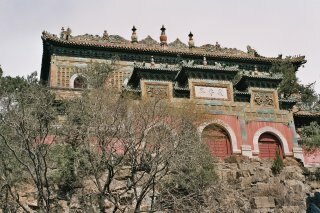 It is also known as the "New Summer Palace", to distinguish it from the remains of an older one. 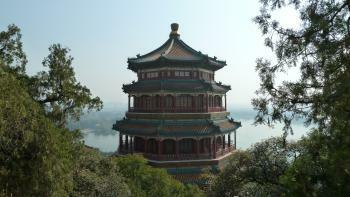 The palace is mainly dominated by Longevity Hill (60 meters high) and the Kunming Lake. It covers an expanse of 2.9 square kilometers, three quarters of which is water. The front of the hill is rich in splendid halls and pavilions, while the back hill, in sharp contrast, is quiet with natural beauty. The imperial gardens date from 1750. The complex suffered two major attacks during the Anglo-French allied invasion of 1860, and during the Boxer Rebellion, in an attack by the eight allied powers in 1900. The garden survived and was rebuilt in 1886 and 1902. This involves a nice bustrip (costing 0,15 euro) to the outskirts of Beijing passing its university. The 'new' Summer Palace is awesome. It's a group of buildings scattered on a hill and along the lakeside. I just couldn't stop taking pictures of the Temple of Wisdom. I think I've fallen in love with yellow and green tiles here in Beijing. And this temple has them all over, together with innumerable little Buddha statues (the ones closest to the ground missing their heads). When I finally wanted a break after gazing at all the temples, pagodas, halls and so on, I stopped for lunch at the Palace's restaurant. After almost one week in Beijing I encountered them here for the first time: can't-be-bothered waitresses huddled together in a corner, hissing mei you when you order something not too spectacular. Enjoy the old-communist ways at the Tingliguan restaurant, with its yellow chairs, plastic table clothes, darkened windows (no lights switched on). It was fun to see all western tourists peeking around the door, and immediately back off, while I enjoyed my shredded pork with green peppers. 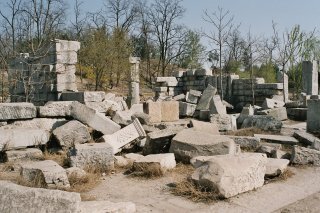 The next day I went to the Old Summer Palace, which is now in ruins. It's like visiting ancient sites in Greece or Italy, though the Summer Palace is quite new compared to them. At most of the sites they placed a model to show how the buildings must have looked while they were still standing. They all look like reproductions of European palaces, amazing to see this here. I visited this WHS in October 2013. There are so many places to explore and so many scenic spots to stop at that this site could easily take up a whole day to cover. The boat trips on Kunming Lake are pleasant and not too long. Visit at sunset to enjoy good lighting on Longevity Hill from Kunming Lake. 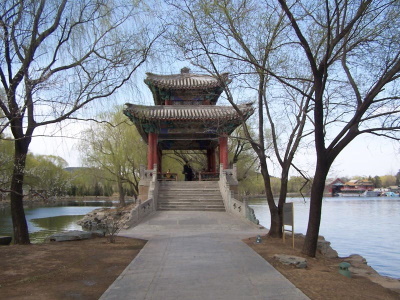 The Summer Palace is a great place to spend a couple hours. The site is large enough that it seems far less busy than some of the other WHS in Beijing. What we see today is largely from 1886-1902. The Summer Palace is an incredible example of Chinese garden design, but its also one of the last great works of the declining Qing Dynasty. 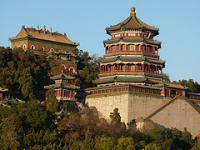 The dynastic cycle ended only 12 years following the last rebuilding of the Summer Palace. 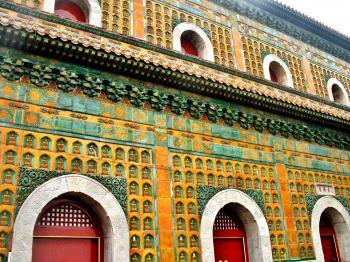 This begs the question, how much was the current Summer Palace even used by Qing royalty? 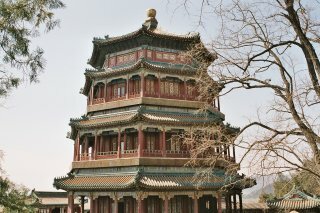 Famously, much of the funds (30 million Tael of silver) to re-build the palace were allegedly taken from the Qing Navy. Perhaps the Qing Dynasty was destined to collapse, regardless of Imperial folly and overindulgence. What are we left to ponder strolling this beautiful palace and garden? For me it was a blend of Imperial grandeur and elegant design; yet the knowledge of the slow death of the Qing dynasty was there as well. Much to my surprise, this turned out to be my favourite site in Beijing. I had originally only scheduled a few hours to explore it, however a bit of a re-jig of my plans allowed a slightly more relaxed pace to my time in the Chinese capital. I entered through the northern gate and had a huge amount of fun clambering up the hill and ducking into the huge amount of pavilions, follies and temples. This provided magnificent views over the lake that is the centre of the palace complex. My particular favourite was the Fragrant Buddha Pavillion which was magnificently decorated and offered hard won vistas from the top of the many flights of stairs. After ducking off to a quiet spot for some lunch I treated myself to a cruise around the lake, which was massively enjoyable in the bright afternoon sun. Back on shore the marble boat and painted colonnade showed the massive artistic merit of the site as well as its monumental excess. Having already done a fair bit of exploring I was happy to wiz through the crowded central palace complex and enjoy a slow sunset watching the elderly men flying kites over the lake. This was an exceeding lovely way to spend my last afternoon in China, and to my surprise really let me enjoy a palace complex. A thoroughly enjoyable and decadent place, that rewarded a leasuirly half day of exploring, my favourite WHS in Beijing. There is now a subway line albeit an almost hour long train ride to the Summer Palace. After seeing the Forbidden city, this place strikes to me as an over-sized catering to the whims of the imperial Chinese emperors (which I guess really is!) This place is really interesting and is a very fascinating glimpse to the playful, artistic and sometimes crazy side of China's past rulers. The Summer Palace is a short taxi ride from the downtown area. The main halls (the "scenic spots") along with sections of the long corridor were being restored. One of the most tranquil sections is on either side of the 17-arches bridge, with its multicoloured flowers and boat piers. Even though the Summer Palace wasn't included in my tour, I made it a point to take the $5 taxi ride to the outskirts of Beijing to see it with my own eyes. It was a tranquil setting and thankfully free of tour groups. The dragon-shaped ferry across Kunming Lake with the scenic 17 Arch Bridge was worth the 50 cents to ride it. The buildings are tremendously ornate and if strolling around the lovely pavillions doesn't convince you that you're in the heart of Chinese culture, nothing will. Although the summer palace was destroyed by foreign army, another palace called Yuenmingyuen was located opposite to the summer palace. I visited both palaces and enjoyed so much at the natural like gardens. Whilst the Summer Palace does not compare to the Forbidden City or the Great Wall, it is still an impressive site. As with the Forbidden City it is over-run with tour groups, but a little bit of effort climbing up to some of the more 'remote' parts of the site will reap rewards. Whilst parts of the Palace were disgracefully vandalised by Anglo-French forces, it is interesting to note that more recent damage, from the Cultural Revolution (mainly the damage to the Buddhist section) is unrestored (and the blame unapportioned). Theatres: Grand Theatre in "Garden of Virtuous Harmony"
Earls of Elgin: The 8th Earl of Elgin (1811-1863). In 1857 he became the British High Commissioner to China. During the Anglo French invasion of Beijing in 1860 he was involved in the decison making which led to the damage and ransacking of the Summer Palace (The British troops involved were led by his brother!) - as well as the destruction of the Old Summer Palace. The former (but not the latter) was rebuilt. General Gordon: Was present, as a 27 year old captain in 1860 at the destruction of the Old Summer Palace "We went out, and, after pillaging it, burned the whole place, destroying in a vandal-like manner most valuable property which [could] not be replaced for four millions. We got upward of ?48 apiece prize money...I have done well. The [local] people are very civil, but I think the grandees hate us, as they must after what we did the Palace. You can scarcely imagine the beauty and magnificence of the places we burnt. It made one?s heart sore to burn them; in fact, these places were so large, and we were so pressed for time, that we could not plunder them carefully. Quantities of gold ornaments were burnt, considered as brass. It was wretchedly demoralising work for an army." 395 Community Members have visited.